Everything was perfect especially the Lady from Tunisia was very helpful. Would recommend this apartment to anyone visiting Aix. The staff, especially Naïma and Kerri, were extremely courteous and helpful and friendly. Many thanks to them! It was like staying in a suite and the kitchen and balcony were great perks. room was spacious with all amenities and had a lovely private patio. location was 4-5 min walk from the city's central fountain, and a block from the grocery. wifi was good, the place was very quiet. would recommend. Useful to ask for parking in the property. Quiet during summer. Great to go to the Opera, near the place. Central location, easy to get about. we liked the area around the retunde. happy atmosphere of aix. The location was ideal for the town, and for the concert halls, which were very close: we went for the music festival. The bed was very comfortable. There was a large terrace which we could use in the morning - by the afternoon it was too hot. A sunshade would have been nice. There was air conditioning. There was a small table and two dining chairs. The staff was helpful. We booked garage space. The garage entrance is some way from the hotel entrance and is down three floors, rather like a catacombe. The staff were supremely helpful. They helped us secure parking in the building at the last minute for a reasonable rate. The apartment was very clean. The location was fabulous, located just a few blocks from old town, and across the street from the mall and the supermarket. Clean, simple and practical. Within brief walking distance of town centre. Location is excellent. Good price/quality. 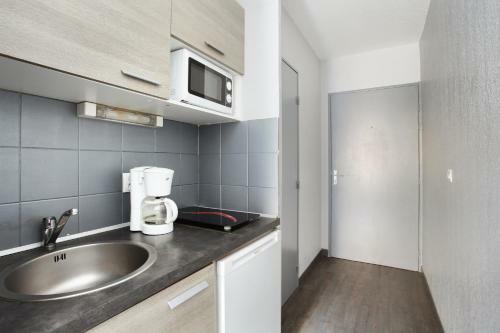 It has an useful kitchenette and fridge. 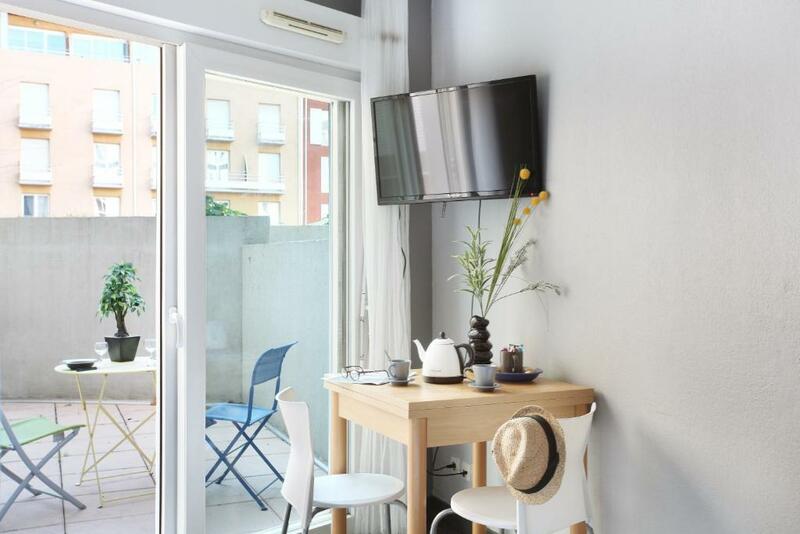 One of our top picks in Aix-en-Provence.Located in the center of Aix-en-Provence, Les Jardins de Mozart offers self-catering studios and apartments. La Rotonde Fountain and Cours Mirabeau Boulevard are 1,300 feet away. Free WiFi is available throughout the property. All accommodations features a desk, kitchenette and a dining. The kitchenette is equipped with a stove, refrigerator and microwave. The private bathrooms have a shower. Some units have a terrace or a balcony. One set of bed linen and towels is included in the price. Facilities at Les Jardins de Mozart include a vending machine and a elevator. A laundry service is available for an extra charge. Restaurants, bars and shops can be found within a 1-minute walk of the accommodations, next to the Grand Provence Theater, the Cité du livre and the Black Pavilion. 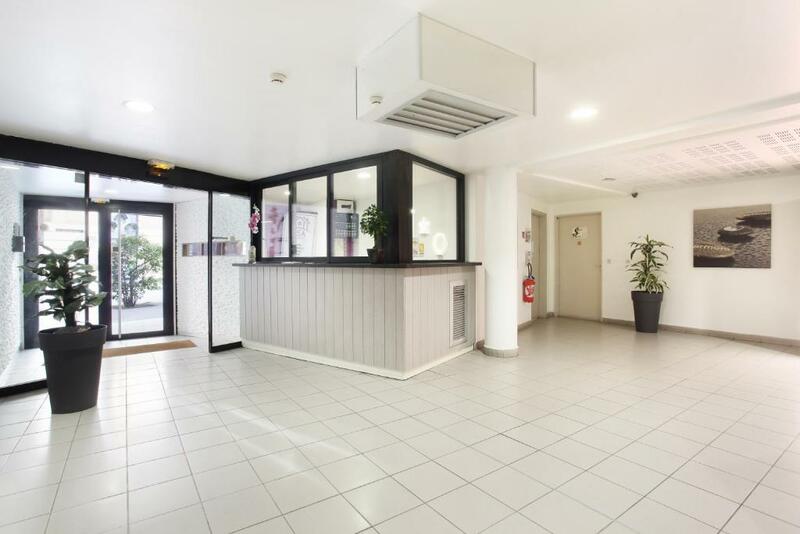 The bus station is only 1,650 feet away where guests can find the shuttles that take you to the TGV Train Station or Marseille Airport. Parking is available on site for an extra charge and upon reservation. When would you like to stay at Neoresid - Résidence Les Jardins de Mozart? This studio features a wardrobe, desk, ironing facilities and a bathroom. The kitchenette includes a stove, refrigerator and microwave. Some also have a terrace or a balcony. Please note that a EUR 250 damages deposit will be requested upon arrival for stays of 2 weeks or more. This may be used to charge for any damages incurred to the accommodations during your stay. This apartment features a wardrobe, desk, ironing facilities and a bathroom. Extras include a sofa, washing machine, coffee machine and a flat-screen TV. The kitchenette includes a stove, refrigerator and microwave. Some apartments also have a balcony or terrace. Please note that a EUR 500 damages deposit will be requested upon arrival for stays of 2 weeks or more. This may be used to charge for any damages incurred to the apartment during your stay. This apartment features a wardrobe, desk, ironing facilities and a bathroom. The kitchenette includes a stove, refrigerator and microwave. Some apartments also have a balcony or terrace. 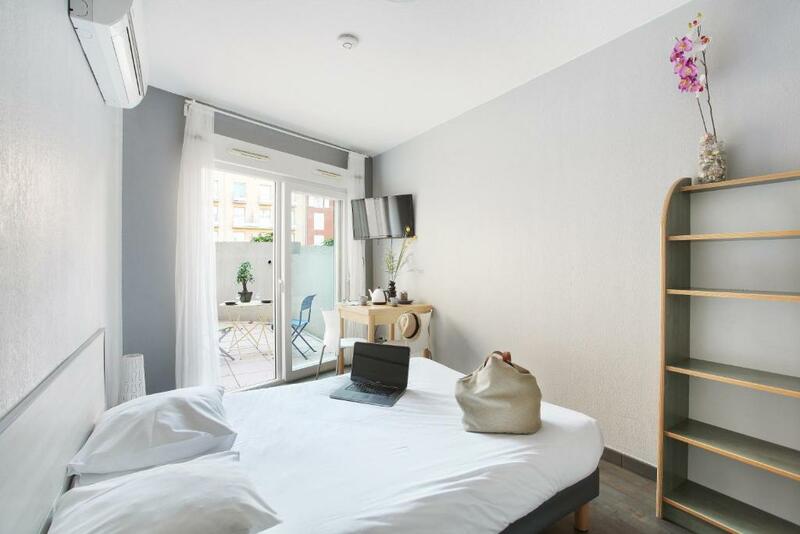 This studio has a small balcony with street view, and double glazing It is equipped either with 2 single beds side by side or a sofa bed, depending on availability. Most rooms have a TV. It also includes bed linen, towels, tea, coffee and snacks. 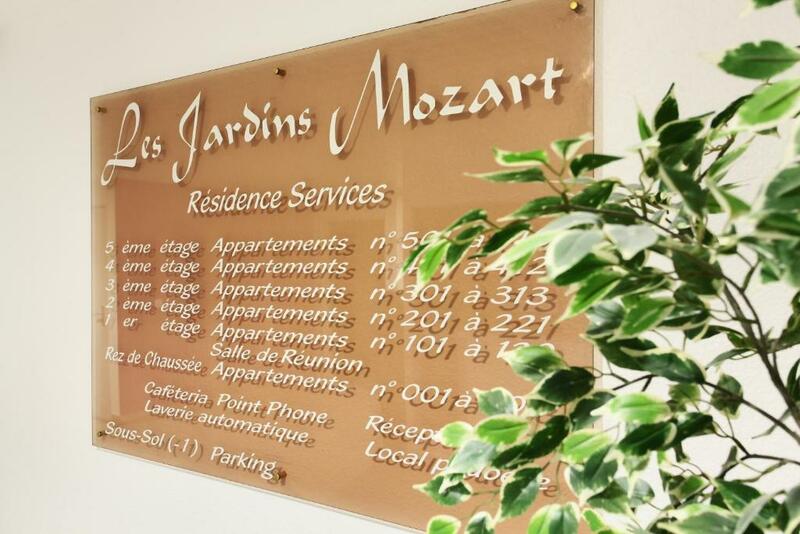 Les Jardins Mozart est une résidence Hotelière bien entretenue, mettant à disposition des appart-hôtel de qualités. 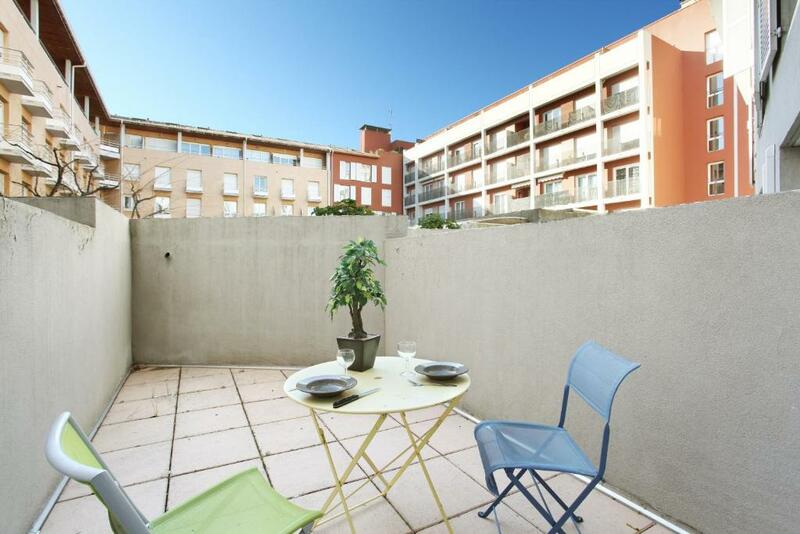 La majorité disposent d'une terrasse orientée sur la cour intérieure, où d'un balcon. 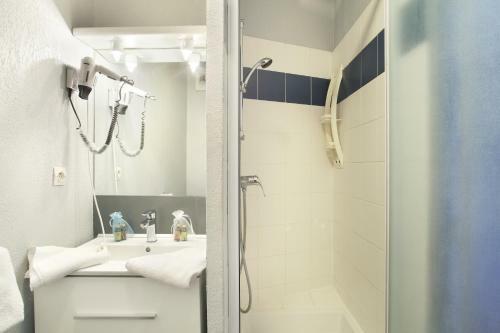 Ils comprennent également une kitchenette avec un panier d'accueil pour votre arrivée, la climatisation dans la plupart des appartements et une salle de bains privative avec linge de bain et articles de toilette gratuits. Leur kitchenette vous permettra de préparer confortablement vos repas et en toute liberté. Par ailleurs, le centre ville historique d’Aix-en-Provence abrite un large éventail de restaurants et de bars, dont de nombreux installés à moins de 5 minutes à pied. Une laverie automatique se trouve au rez de chaussée, un accueil ouvert 6/7 j pour vous accueillir et vous renseigner. Un personnel à votre écoute proposant des services flexibles à la demande. L'accueil reste à votre entière disposition pendant les heures d'ouvertures afin de vous orienter vers les "meilleurs restaurants " du coin , vous renseigner sur les bon plans, les coins à visiter . Notre région est notre passion, nous saurons vous l'a faire partager à notre manière. House Rules Neoresid - Résidence Les Jardins de Mozart takes special requests – add in the next step! Neoresid - Résidence Les Jardins de Mozart accepts these cards and reserves the right to temporarily hold an amount prior to arrival. Three days before your arrival, you will receive an email containing all the information to access your room even outside opening hours. Please contact the property if you haven't received this email. Please note that a EUR 250 damages deposit will be requested for stays of longer than 1 week. This may be used to charge for any damages incurred to the accommodations during your stay. Guests are asked to clean the kitchen upon their departure and to take the bins out. The property will change linen for stays of a week, or upon request at the reception. The bathroom should be renewed, because it is in a poor condition. The bed sofa is unconfortable in the apartment. Good location for a short time stay. The room is very small and basic. Our room was very dirty and it turns out the sheets had not been changed, so we slept in someone else's sheets which had blood stains and hairs in it - we were disgusted! We had a booking for 4 nights but after the first night we left. The staff offered to clean the room for us and did not charge us for that night or the remaining nights but we still left and found somewhere else to stay. It is not even good value for money, I would not recommend. This is a budget student housing from the 1990s, which has seen better days. The floor was dirty, and the amenities are in a dire state. Reported to the host that there was no hairdryer in the apartment, was informed that there should not be one, we pointed out that the information Booking gave said there should. Then the man behind the counter said there should be a hairdryer in the apartment. They then said they would get one in. Went back the next day and the member of staff said they could not get a hairdryer from the supermarket and just shrugged her shoulders. The room is very small with very little space around. There is little storage space for clothes etc. and only one bedside cabinet for small items. The small kitchen area was ok, reasonable well equiped, but could have a better range of cutlery, trying to spread butter with a steak knife is not easy! We were there for two weeks. We had a very good deal for the price, but the company took the total money, over 1000€, from my bank account some months before, without notification, A week after leaving they took an additional 160€ without explanation or notification. It might be payment for the garage. No air-conditioning was a problem at night; street outside noisy.